Guys, behold my opus: strawberry shortcake. She's a beauty alright. You knew this was coming. I've been hooting and hollering about strawberry season in Oregon for a good few posts now. First there was strawberry ice cream. Then there was my sweetened condensed milk loaf with strawberries and cream. But I'm not gonna lie — those were first of the season strawberries. Good, but not the best they could be. Similar to my recipe for the sweetened condensed milk loaf, I wanted to find a recipe that featured strawberries as the star — a strawberry shortcake seemed like the best solution. 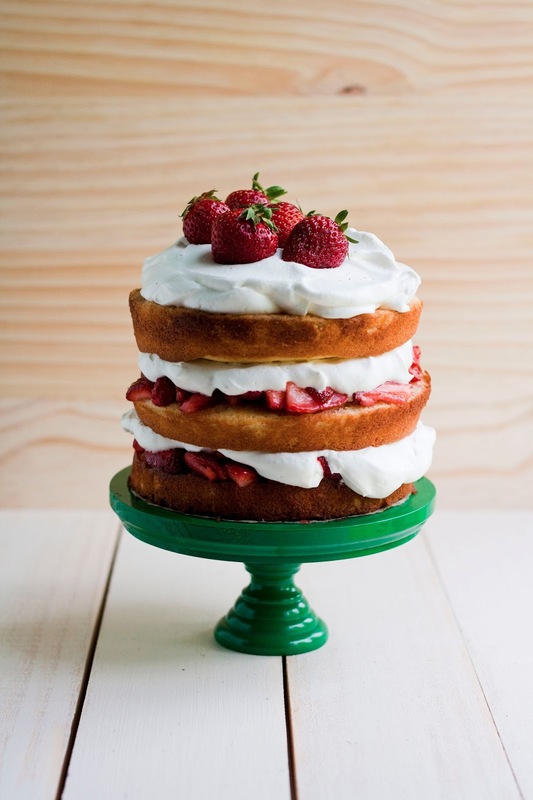 Nothing but layer upon layer of buttermilk cake, macerated strawberries, and whipped cream, this cake is a dream. I recently brought it to a dinner party where our host actually exclaimed in delight when he saw the cake. It was the perfect springtime dessert. 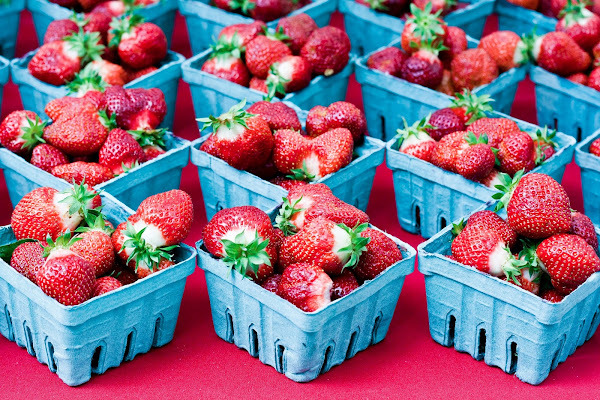 Choose strawberries that are darker red and smaller — this signifies that the berries are riper, which means they'll yield more juice and will be sweeter and more intense in flavor. Make the strawberry filling first by allowing the strawberries to macerate (fancy word for soak) in sugar, vanilla, and rose water. The rose water imparts an almost flowery taste to the cake — I'm a big fan, but feel free to exclude if you're opting for a more traditional shortcake flavor. The cake uses three small 6-inch cake pans to make a buttery buttermilk cake. You can probably use bigger, more traditionally sized cake pans to make two layers, but be sure to adjust baking time accordingly. According to the cookbook I adapted the recipe from, it's a little unsual to use all baking powder and no baking soda in a cake that contains buttermilk. It was done in this recipe to emphasize the nuttiness of the buttermilk and to produce an extra-tender crumb. The cake layers can be baked up to 2 days in advance; to store, allow the layers to cool completely before wrapping and refrigerating. The finished shortcake will NOT hold up for more than a day — the whipped cream will loose its fluff, and cause the entire cake to lose its structural integrity. However, it's important to assemble the dessert at least an hour in advance so that the juice and cream have a chance to seep into the cake layers and allow all the flavors to meld together beautifully. Clean and hull 2 pints strawberries, slicing each berry into pieces about the thickness of a nickel. Place sliced strawberries in a medium bowl, and sprinkle 1/2 cup granulated sugar over the berries. Add 2 teaspoons rose water extract and 2 teaspoons vanilla. Use two rubber spatulas to gently toss the strawberries in the sugar and extract until well combined. Cover the bowl with plastic wrap and let the berries macerate at room temperature, until they exude their juices (at least an hour or longer). Preheat the oven to 350 (F). Grease the bottoms and sides of three 6-inch round cake pans. Line the bottom of each with a round of parchment or waxed paper; grease the paper. In a medium bowl, whisk together 1 1/2 cups cake flour, 2 1/2 teaspoons baking powder, and 1/4 teaspoon salt. Set aside. In the bowl of a freestanding electric mixer fitted with a paddle attachment, cream together 5 tablespoons unsalted butter with 3/4 cup granulated sugar and 1 teaspoon vanilla extract on medium-high speed until light and fluffy (this should take around 2 to 3 minutes). Lower the mixer to its slowest setting, and add 2 eggs one at a time, scraping down the sides of the bowl well after each addition. With the mixer speed still on its lowest setting, add the dry ingredients (from the second step) in three parts, alternating with 2/3 cup butter milk in 2 parts — you should finish with the remaining third of the dry ingredients. Mix only until each ingredient has been incorporated; BE CAREFUL NOT TO OVERMIX. Once both the dry ingredients and buttermilk has been incorporated into the batter, divide the batter among the three prepared cake pans and bake for 20 to 25 minutes, or until a wooden toothpick inserted in the center comes out clean. Allow to cool in the pans for 10 minutes before inverting onto wire racks to cool completely. Don't forget to remove the parchment circles! One the cakes have cooled completely and you're ready to start assembling the cake, make the whipped cream. In the bowl of a freestanding electric mixer fitted with a whisk attachment, combine 1 1/2 cups cold, heavy cream with 2 tablespoons granulated sugar. Whisk on medium-high speed until the mixture is stiff and starts to form stiff peaks — be careful not to overmix, or you'll end up with butter! 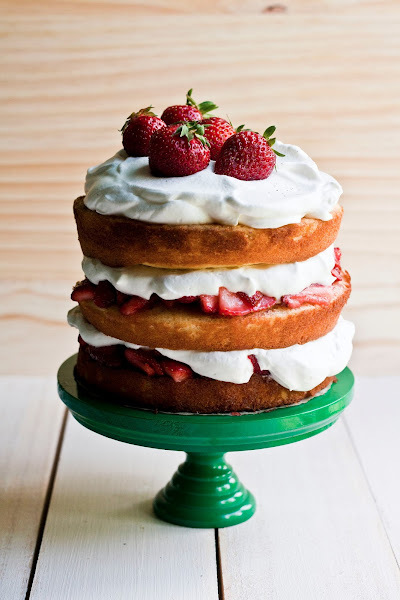 To assemble the strawberry shortcake, place one cake layer, flat side down on a small cake stand or a serving plate. 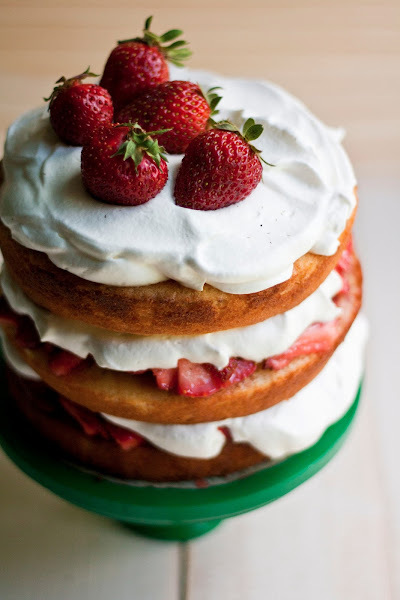 Use a fork or a wooden skewer to poke holes in the cake, before carefully topping with 3/4 cup of the strawberry filling. Spoon the filling over the entire layer and make sure the juices go into the cake layer (they should start seeping into the holes you poked) and not the plate. Top the strawberries with 1 cup of the whipped cream, using a rubber spatula to make sure the cream stays in the middle of the cake — when you place the second cake layer on the cream, the cream will automatically spread out over the berries from the pressure of the second cake layer. Top the cream with a second cake layer. Repeat the first two steps for this layer, before topping with the third and final cake layer. Make sure that the final cake layer has the flat side up of the cake up. Cover the final layer with the last of the whipped cream and garnish with whole berries. For best flavor, eat immediately OR allow the cake to refrigerate for about an hour before slicing. Allowing it to refrigerate for an hour allows the cake to soak up some of the strawberries' juices. 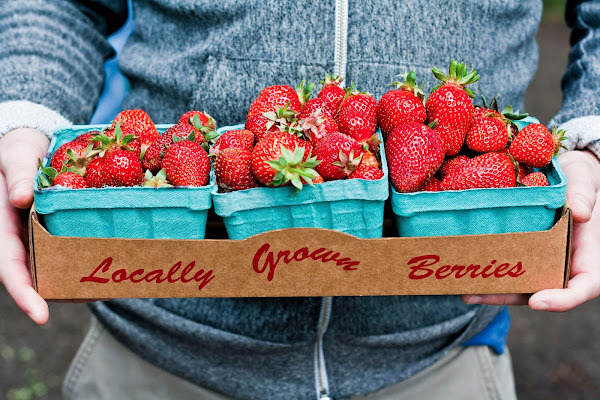 LOVE Oregon strawberries, and Hoods are the best! This recipe looks fantastic. This looks gorgeous! I just want to reach through the screen and eat it. So very beautiful! I can't wait til the strawberries start appearing at the farmers market. What a total stunner of a cake! What a stunning cake. I love how rustic it looks with its bare sides. I wish we had farmers markets here like you do. I'd love to see fresh strawberries like that. I made this cake for my birthday dinner last night and it was a huge hit! Thanks so much for providing this recipe. Your cake looks beautiful and I'm happy I chose to make it. Good to hear, and happy birthday!!! Please feel free to share pictures or a post of the cake. I'm always happy to see what other people have done with the recipes I post! You forgot to say when to add the vanilla in the batter in the directions, therefore my 10 year old didn't read it to me when I was putting it all together. I think it worked out (I dumped all batter back into the bowl, added vanilla, then poured back into the pans), we'll see in 25 mins or so when it comes out of the oven. OH NO! Thanks for the head's up. I'll fix it now. I hope the cake turns out okay! I made this yesterday and it was a huge hit. I used 9 inch rounds and it looked and tasted amazing!